A BIG attraction since 1976. From the day Rex's opened in an Oklahoma gas station, diners flocked to taste the new idea in breaded chicken. Word spread and travelers across the USA were mapping a route that brought them to Rex's for crispy bite-size chicken, fabulous warm frybread and home-style sides. We don’t have a clue what makes people drive a thousand miles to see a gigantic leaping muskie, blue whale, or a palace of corn, but we do know what makes them stop by Rex's Chicken — it's food too good to pass up! Vernon McFarland perfected a new way to prepare chicken with a special marinade and breading that created a delicious and juicy flavor profile. Mr. McFarland opened the first Rex's Chicken restaurant in McAlester, Oklahoma. So, into a fast food world of legs, wings, and drumsticks- he chose to serve 100% boneless breast of chicken before any other restaurant in America. The upstart boneless chicken restaurant grew to over 35 locations between 1976-1992. 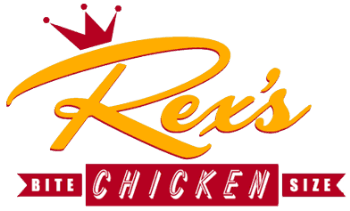 Rex's Chicken Franchise System was founded in 2007 with the sole purpose of carrying on Vernon McFarland's vision of serving the freshest boneless chicken, fry bread, and sides at locations across the United States.